Each year, six red roses are delivered to the British Consulate General, Chicago, Kansas City, St Louis, and Minneapolis on or around August 1st Anonymously. ANNIVERSARY IN MEMORY OF THEIR ANCESTORS. The roses have been coming to this office almost every year since at least 1967. We should like to thank our anonymous donor. Is there any chance that we might thank him in person for paying honour every year to the men who fell on August 1, 1759? Or are we correct in supposing that the roses may be ordered by a lawyer, in execution of a will? A visitor to this office on August 1, 1991 asked if the roses had been delivered then remarked "It may not go on much longer" and left without further conversation. We were all the more delighted when the Minden Roses arrived again in 1992 and every year since, except 2001 and 2002. The Battle of Minden took place during the Seven Years War (of which the French and Indian War was a colonial sideshow or vice versa, depending on the viewpoint). The six British regiments at Minden were part of a 43,000-strong Anglo-Hanoverian army led by Ferdinand of Brunswick which defeated a French army of 60,000 led by the Marshal de Contades. Contades bitterly remarked, "I never thought to see a single line of infantry break through three lines of cavalry ranked in order of battle, and tumble them to ruin." The British troops lost 321 (killed or wounded), with Kingsleys [20th Foot] suffering the heaviest casualties. Minden is located on the River Weser, not far from Hanover, Germany. It is still a garrison town, and the British Army is billeted there in some strength. Each year the battle is commemorated with a joint British and German wreath-laying ceremony with a suitable reception usually hosted by the local British brigade commander afterwards. 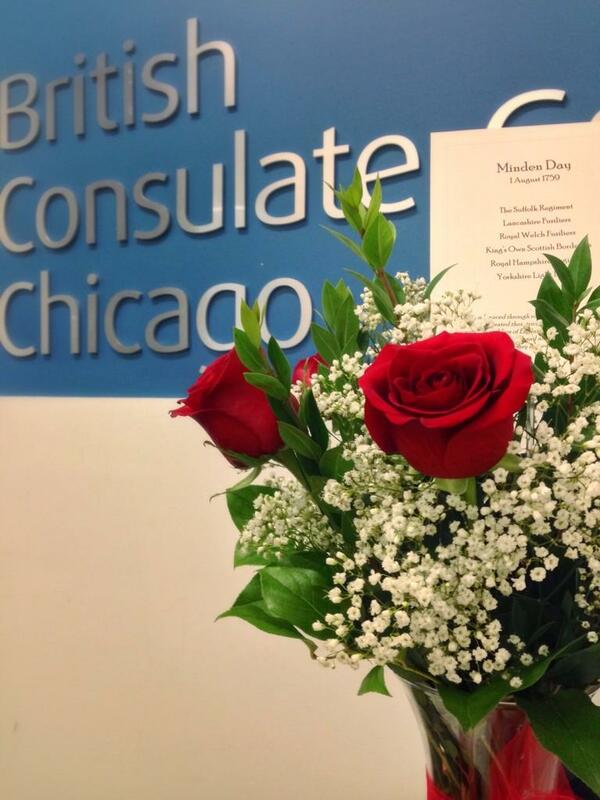 I have email the British Consulate General,in Chicago, to see if they have had their Roses this year. Thank you for your message. The Minden roses indeed arrived again this year. I am attaching a copy of the press release which we are sending to local media. As in years previous, we are unable to identify the anonymous sender. This annual tradition has gone on since at least 1967 in Chicago, possibly earlier but we could not confirm that. The British government offices in Kansas City, St Louis, and Minneapolis also reported receiving roses until those posts were closed. Given how long this tradition has gone on - some have speculated that the roses are ordered by a lawyer in execution of a will. THEY ADVANCED THROUGH ROSE GARDENS TO THE BATTLEGROUND AND DECORATED THEIR TRICORNE HATS AND GRENADIER CAPS WITH THE EMBLEM OF ENGLAND. THESE REGIMENTS CELEBRATE MINDEN DAY STILL, AND ALL WEAR ROSES IN THEIR CAPS ON THIS ANNIVERSARY IN MEMORY OF THEIR ANCESTORS. The donor is a mystery to us. Twice in the past the customer had sent a money order in the name of X.T.Atkins, presumably a pseudonym for a British ex-serviceman, since Tommy Atkins is the British equivalent of G I Joe. The envelope was mailed from North Suburban Illinois and Westchester IL, giving a fictitious address: 1759 Albion - combining the date of the battle and the ancient name for Britain. We assume that the donor had an ancestor who fought and fell at the Battle of Minden, or that he himself served in one of the regiments. Members of these regiments to this day wear roses in their caps on Minden Day, and the officers actually eat them in champagne at dinner. The Battle of Minden took place during the Seven Years War and the six British regiments at Minden were part of a 43,000-strong Anglo-Hanoverian army led by Ferdinand of Brunswick which defeated a French army of 60,000 led by the Marshal de Contades. Minden is located on the River Weser, not far from Hanover, Germany. Each year the battle is commemorated with a joint British and German wreath-laying ceremony with a reception to follow. We should like to thank our anonymous donor. Is there any chance that we might thank him in person for paying honour every year to the men who fell on 1 August 1759? The mystery is quite fascinating and I just wonder if this person could have anything to do with it because the time-line fits perfectly. Promoted to lieutenant general, he was posted in 1967 to Washington, DC, as head of the British Services Joint Mission, the link between the British and American Joint Chiefs of Staff. Maintaining the close alliance in a period of British economic difficulty and defence retrenchment was not easy. But the Americans opened their offices and confidences to him more fully than protocol demanded, because they liked and respected him, as the chairman of the American Joint Chiefs observed on his retirement in 1970. The identity can be found in our pages. fascinating stuff as the tradition obviously still goes on having shifted the scene from Kansas City to Chicago. Looking in an old copy of the Gallipoli Gazette No 92 Autumn 1964 there are letters which show that the tradition was going since at least 1950 to the Kansas City Consulate and it obviously switch to Chicago when that office closed. I think it must be a bequest in someone's will??? I quite unashamedly sucked up to the Mess Colour Sergeant for a week or two before the Minden Dinner and received the most tender and delicious young rose without a single thorn. I am, however, ashamed to say I can't remember who he was now. It's an age thing, don't ya know! When I joined in 1948 every newly commissioned officer who had never eaten a Minden Rose did so on Minden Day. Mine was as big as a cabbage and swilled around in a silver dish with at least half a bottle of champagne. There were about five of us. I well remember "Squeeker" Briggs was the PMC. I was Mr Vice as the most junior officer present and had to do the Loyal Toast, Sgt MacDonald was the Mess Sgt ( his waxed mustache was bigger than Kitners), Cpl Fitzpartick was Mess Cpl, L/Cpl Wright was Mess Barman, Ptes Cassen and Crew were Mess Cooks. ***t I can't remember the names of the Mess Waiters .....it must be dementia Mike? But it was a great evening...happy days almost 60 years ago.